OzInverter Updates, amendments and modifications. Jan 2018, slight Price increase to cover the standard postal rate of $22 for most normal postage places in the World. If I have a problem in sending to your location, I will contact you by your email address. From June 23rd 2016, The New OzControl Board PCB that I supply, will be the Pin 6 start and stop circuit amendments that 'Oztules' has now perfected. October 2016....... No 8 OzControl board PCB, The Pin 6 start method needs to have short On/OFF switch cables, about 100mm in length, as this start method can be temperamental. The over temp method for ON/OFF can still be used on the New Control Board, but the 1k6/5 resistor to PIN 6 should be removed, and the PIN 6 ON/OFF switch plug should be removed and a jumper installed. In the Over Temp Start stop method the PIN 6 should have a constant +5v. Dec 2017, New No12 Ozcontrol Board PCB with all possible operating functions. This is the Final design. Please see the OzInverter page .... http://www.echorenovate.com/the-ozinverter.php ... on this site, for the photos, July 20th 2016, and Jan 2018 for details of the component layouts/types and positions on the OzControl Board. Toroid cores, ....... I have been asked. We use standard toroid core silicone iron at 0.3mm thick that is then wound. There are commercial manufacturers toroid core winders around the World, most have facilities to wind to a maximum of 60mm thick, so 2 cores stacked and glued together would give us 120mm thick, with a core internal diameter of 100mm and a outside diameter of about 200mm diameter. This would give us an ideal core for the 6kW Ozinverter working at a real 6kW. It is also possible to scavenge cores from scrap Grid Tied Inverters, (GTI's) that are broken or replacements by Solar installation companies. Most GTI's are designed for only a life of 10 years. On a GTI, Unwind the windings to get at the core, and unwind the centre of the core to about 100mm diameter, its only lightly spot welded, and then tightly wind on the outside to get the required outside diameter. Remember we wind our copper enamelled turns onto the cores depending on the square cross-sectional area of the core. Yes, the simple empirical maths formula's are in the book. We then wind the copper turns on and fix each layer of turns, again its all in the book. A OzInverter capable of running at 8kW to 10kW. The bare toroid core is 38kg at 230mm OD, 100mm centre hole and 140mm high /thick. 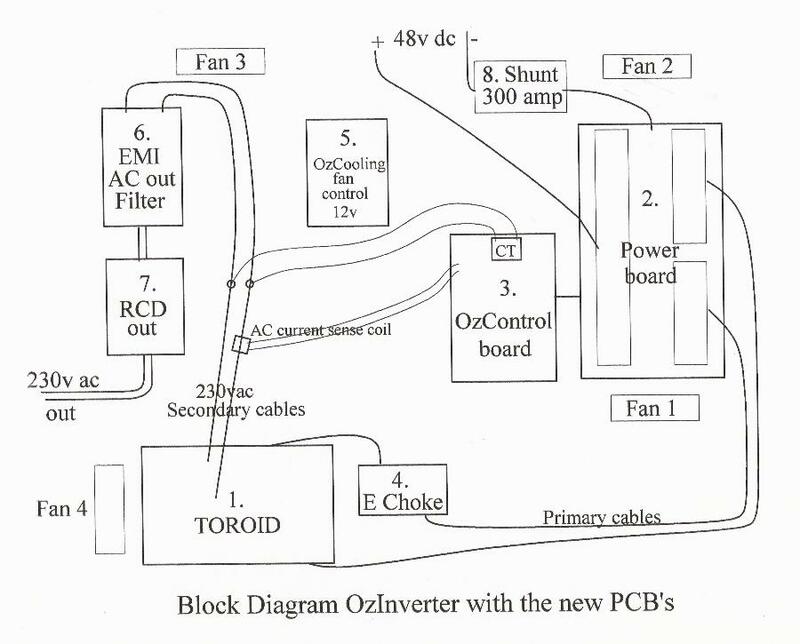 Thank you for your support with this OzInverter Project, and I trust it helps you!